How can I get remote access to all the files on all my computers? How can my employees gain remote access to all the files they need when they are not in the office? Is there a file sharing solution that allows files to be shared from any desktop, server, or the cloud? Is there any way to avoid spending days uploading all my files to the cloud just so I can share them or access them remotely? Can I create a private cloud for all my local and cloud storage? 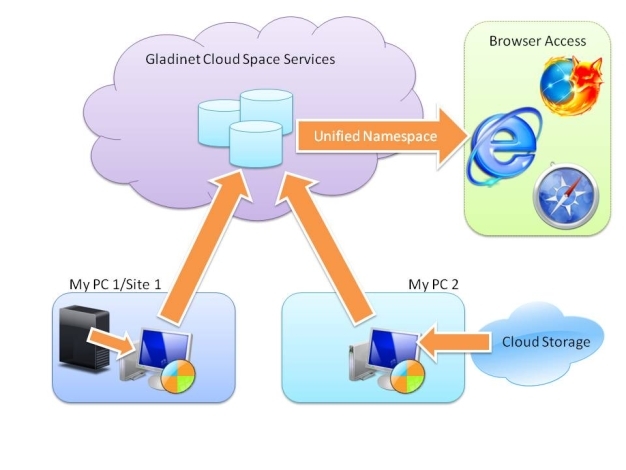 Gladinet has introduced a new service called Gladinet Cloud Space which solves these problems and creates a file sharing platform by creating a private cloud. The service allows you to use Internet Explorer or any other web browser to browse, download and upload files on any of your machines, whether they are stored locally or in the cloud. Better yet, it does this without transferring all of your files into the cloud, or syncing them across multiple machines, thereby creating a very bandwidth friendly file sharing solution! This file sharing solution is possible because Gladinet Cloud Space allows computers to be added to your private cloud, making it unnecessary to spend hours uploading all their files to the cloud. Once a computer is added, all of the files on its local disk (or in a cloud storage service that has been attached to the computer) become accessible from Internet Explorer, Firefox, or Safari. The ability to create a private or shared personal cloud that unifies access to all files regardless of where they live. To create a private cloud you just need to create a cloud space account. Register the instance of Gladinet Cloud Desktop or CloudAFS with Cloud Space using the Gladinet Management Console. Login to http://mycloud.gladinet.com to see your registered instances. Browse, upload or download files on these instances using the web browser. You will be able to access files stored on the instances or in the cloud. For more information, please visit: http://www.gladinet.com or watch this video.